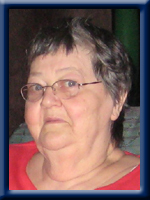 Beverly Gail Conrad (nee Freeman) -72, of Liverpool passed away peacefully surrounded and tightly held by her family at Queens General Hospital in Liverpool on November 22, 2010. She was the oldest daughter of the late Ruth Eldora Boland and Joseph Allan Freeman. Bev worked at Fahie’s Nursing Home, Lane’s and the Transcotia Motel as a cook. She leaves behind daughters Vicki (Gerard) Lewis of Liverpool, Cheryl (Stephen) Beaton of Brooklyn, Brenda Munroe of Charleston, Lori (Dave) Drew of Timberlea, Julie (Byron) Thorburne of Liverpool and sons Vernon “Ricky” (Becky) Munroe of Liverpool, Brian (Sharon) Munroe of Mersey Point, Ronnie Munroe of Liverpool, and Glen (Annette) Munroe of Liverpool. Grandson, Andrew Freeman of Charleston. Sisters Anna (George) Roberts, Joan (Peter) Whynot, June (the late Gerald) Wagner, Janet (St Clair) Whynot of Liverpool, Margaret (Alan) Hatt of Molega, Elizabeth Langille of Halifax. Also surviving are the many grandchildren and great grandchildren that love her very dearly. Bev (Nan) was always helping someone and her kind and giving spirit will be missed. Predeceased by her first husband Vernon Munroe, late husband Leonard Conrad; grandson Michael Munroe and great-granddaughter Chloe Beaton. My sincere condolences to the family of the late Beverly (Munroe) Conrad. She will be sadly missed by all that knew her. You are in my thoughts and prayers. We are very sorry to hear of your mother’s passing. We knew that you took care of both Leonard and Bev in their time of need. There is no greater love than a child has for a parent or a parent has for a child. May you look back and see all the good memories that were left behind. We would like to offer our condolences at this time of loss and sorrow. Dearest Cheryl: Sorry to hear of your Mother’s passing, our thoughts and prayers are with you during this time of sorrow. Our thoughts and prayers are with all you at this sad and difficult time. I was so sad to hear about your loss. Bev was the most loving, kindest lady I have ever met. She always had a good word to say about everyone she met. Her and Leonard are together again and her presence will be felt by you always. Til we meet again Bev. Love ya! Bev was always kind and a very friendly and loving person. Our deepest Sympathy to all of the families. JUST REMEMBER ” WHEN SOMEONE YOU LOVE BECOMES A MEMORY, THAT MEMORY BECOMES A TREASURE!!! Losing a sibling is never easy, espically when it’s the first one…I will remember all the good times we shared and hold your memories close at heart…until we meet again. Our sympathy to the family of the late Bev Conrad. You are in our prayers at this difficult time. Sorry to hear of your loss. you and your family are in our prays.Our sincere sympathy to the family. Losing a mom or sister is never easy, espically when it’s the first one…we have to remember all the good times we shared and hold your memories close at heart…until we meet again. sincere ympathy to you and all your family. TO BEV’S FAMILY -SO SORRY TO HEAR OF HER PASSING! JUST TO LET YOU ALL KNOW ARE THOUGHTS ARE THERE WITH YOU AT THIS SAD TIME! I am so sorry to hear of Bev’s passing, I loved spending time with her during her respites. She was a one of a kind lady, loved all her kids and was there for all her family. Take care of one another now and know she is still watching over you. Please take care of yourself Brenda, I will be praying for you. To the Family, I got to know Bev through my work and through her, a lot of her family. She was a very kind loving woman , who loved her children and grandchildren and all those that followed. My sympathy’s to you all, may you all treasure your memories. Bev, I too will miss you. So very sorry to hear of your loss. Please accept our sincere condolences. We are sorry to hear of your Great loss. You have our deepest sympathy on the loss of your Mom. May God be with you all during this difficult time. You remain in our thoughts and prayers. mom u may have left us, but u will always be forever in our hearts. u have raised ur children to be the best people that they can ever be, and u dont know how much we love u for that. u made us strong to handle just about everything that live has to throw at us and this is about the worst thing we could ever endeavour. but with u and dad as our special angels, we will get through just about as much as we can. until we all meet again, our parents will be forever in our hearts. Sorry to see the passing of your Mom Cheryl. Our thoughts and prayers are with you and the family. God’s blessings be with you all at this difficult time. So sorry to hear of Bev’s passing. My sincere condolences to all the family. Bev was a women of heart, and I will miss seeing her. I wish her safe passage. To her family, I can only say I am sorry for your deep sadness and pain at this time..
We were saddened to hear of Beverly’s passing. Losing a mother can be like losing the glue that holds the family together….so hug each other, share your stories and laugh and cry at the memories….her love and guidance helped make you the people you are today. Our thoughts and prayers are with you all. We was so very sorry to hear of Bev passing away.We have know Bev and the family for a long time, she was a great lady and always had lots of love to give to her family and friends, she will be greatly missed.Our Thoughts and Prayers are with all the family at this sad time. Dear Cheryl and families we was so sorry to hear of your mothers passing ,Our thoughts and prayers are with u all at this sad and difficult time . Sorry to hear of Bev’s passing, enjoyed working with her at Lanes, my thoughts are with her family at this sad time. To all the family of Bev I send my sincere condolences. When I was a kid she was my second Mom. she will be missed by all.So very sorry for your loss. Sorry to hear of your loss. Our thoughts and prayers are with you and your family. So sorry to hear about your Mom.My thoughts are with you,take care. dear vicki, i am so sad to hear about ur mom. i have spent some time remembering our days at the transcotia and seems like time disappeared so quickly. i did chat with lori and penny a week ago and sent u hugs. dad has left us 11 years and i can honestly say that time has away of easing but ur heart will always be filled with love and always hold on to friends and family. i hope to get a chance to see u as it has been too long. sending u my prayers and hugs. friends always . pam,and gary. So sorry to hear of the loss of your Mother. What a wonderful person she was. Our hearts go out to all of you. May God Bless you all.